The Mother of all Martinis? The Martini is the most iconic of cocktails. But it hasn’t always been the crisp, almost austere drink we know today. Back in the 19th century, when the drink was growing up, it was much sweeter. And it probably was made with sweet vermouth (the red stuff). Which just happens to be a key component of the Martinez Cocktail – from which the Martini may have developed. The Martinez has an old-fashioned vermouth-forward flavor that fits well with today’s craft cocktail scene. Although definitely sweeter than a Martini, it’s not cloying, so it works as a pre-dinner drink. So mix up a true ancestral tipple. And tell your dinner party guests that you’re researching cocktail genealogy. For an authentic Martinez, you’ll need Old Tom gin. That isn’t a brand name – it’s a style of gin (just as “London dry” is a style). Old Tom is less floral than the gin you’re probably familiar with, and a bit sweet. Old Tom was very popular in the 19th century, but later fell from favor. A good liquor store will probably carry at least one brand of Old Tom – just ask them. But if you don’t want to spring for a whole bottle, we’ll discuss alternatives in the Notes. The original recipe for the Martinez calls for twice as much sweet vermouth as Old Tom gin. The result is a drink that tastes more whiskey-like than gin-like. In fact, it reminds us quite a bit of a Manhattan. We include a recipe for the original Martinez in the Notes, but we recommend a more contemporary version of the drink. We like a recipe we saw in the New York Times, one that was developed by Frank Caiafa, manager of the Waldorf Astoria’s Peacock Alley bar. Caiafa has recently revised the Old Waldorf-Astoria Bar Book. 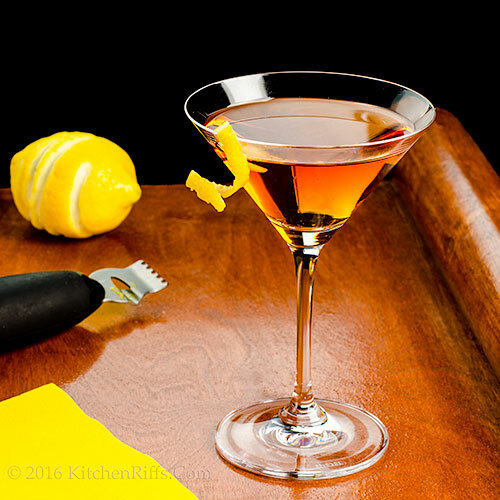 He reworked some of the classic recipes in the book (including the Martinez) to better reflect contemporary tastes. Add all ingredients (except garnish) to a mixing glass half-filled with ice. Stir with a long-handled spoon until the contents are well chilled (20 seconds or so). Strain into a cocktail glass, preferably one that has been chilled. Garnish with a lemon twist, if you wish, and serve. Why stir rather than shake this drink? Because all the ingredients are clear. Shaking introduces small bubbles, which can make a clear drink cloudy. (If some ingredients are opaque – citrus juice, for example – you can shake because the drink will be cloudy anyway). A quick lesson on making lemon twists: It’s easiest to cut twists if you have a channel knife, which is specifically designed for this task (you can see one in the picture that appears above the Notes; we use the Oxo brand, but there are other good ones available). Cut the twist to the length you desire. Then take a thin round cylindrical rod of some sort – a round spoon handle, or even a straw – and wrap the twist tightly around it. Press both ends of the twist slightly inward, towards the center. This helps set the shape. Release the twist from the cylindrical rod/spoon handle/straw/whatever, and add the garnish to the glass. BTW, as you cut the lemon twist, hold it over the drink you’re about to serve. Cutting releases some citrus oils, which will fall into the glass and add extra aroma. 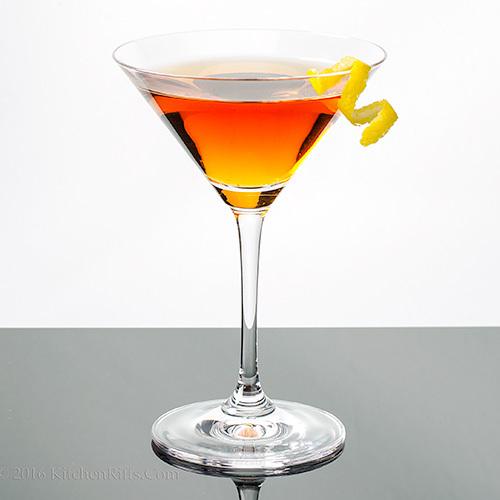 The original recipe for the Martinez Cocktail calls for 1 ounce Old Tom gin, 2 ounces sweet vermouth, a teaspoon of Maraschino liqueur, and 1 dash of bitters (Boker’s was the brand used back then, but Angostura works as a substitute). 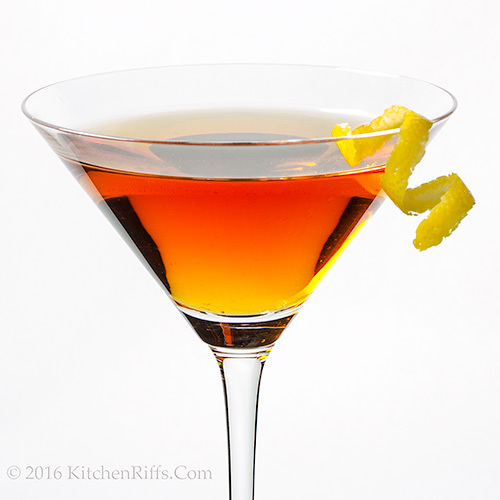 As noted above, this recipe yields a drink that reminds us very much of a Manhattan. Maraschino liqueur is made from Marasca cherries, including the crushed cherry pits. It’s a clear liquid with a taste that’s the polar opposite of the sweet, brightly colored “maraschino” cherries you might put on an ice cream float. This liqueur was developed at a Dominican monastery in Venetian Dalmatia during the 17th century. It wasn’t named “Maraschino” until about 200 years later, when industrial production began. Old Tom gin was particularly popular in England during the 18th and 19th centuries. In the US, rum and later whiskey (usually rye or bourbon) were the spirits of choice until the mid-19th century. If you don’t want to buy a bottle of Old Tom to make a Martinez, we suggest using a fairly mild gin like Plymouth or maybe Boodles. If you want a more traditional drink, use 1 ounce gin, 2 ounces sweet vermouth, 1 dash orange bitters, and ¼ ounce Maraschino liqueur. If you want a more modern flavor, try 2 ounces gin, 1 ounce sweet vermouth, ¼ ounce Maraschino liqueur, and a dash or two of orange or Angostura bitters. 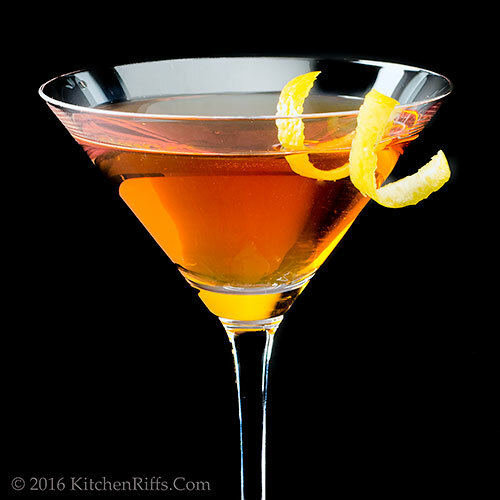 If you prefer a drier drink, try 1½ ounces gin, 1½ ounces dry vermouth, 2 dashes Angostura bitters, and ¼ ounce Maraschino liqueur. We’ve mentioned several brand names in this post. Our usual disclaimer: We’re completely noncommercial and we don’t get compensated for mentioning brands. We buy our own booze, and recommend only what we buy and like. Some history about the Martinez (and the Martini): By the 19th century, whiskey had become a popular spirit in the US. Bartenders often mixed it with bitters and maybe some sugar. They also discovered that whiskey had a real affinity for sweet vermouth, so they started mixing the two together. They liked the result so much that they soon began mixing vermouth with brandy, and probably most other spirits. Except for gin, which hadn’t yet gained popularity in America. Eventually gin caught on here, though, and someone decided to see how it tasted with (sweet) vermouth. Who first had the idea? There are several theories. One story says that legendary mixologist Jerry Thomas was the first to combine the two when he worked in San Francisco during the 1860s. Supposedly a visitor to his bar, who was en route to the town of Martinez, asked Thomas to create a drink for him. Thomas mixed up a cocktail he dubbed “the Martinez,” in honor of the traveler’s destination – and made cocktail history. The name eventually morphed into “Martini.” Years later, the sweet vermouth that Thomas used was replaced with dry, and the modern Martini evolved. Another story says that Julio Richelieu, who tended bar in Martinez during the 1870s, mixed the first version of the drink. Other legends say that gin and vermouth first came together in New York City. According to one story, a judge named Martine invented the mix at New York’s Manhattan Club. A competing story says the gin-and-vermouth combo was first mixed at New York’s Turf Club. Which of these stories (if any) is true? Who knows? The idea of combining gin and vermouth seems so obvious that we suspect numerous bartenders came up with the idea. FWIW, we tend to think that Jerry Thomas invented the original Martinez Cocktail, while one of the New York entities – probably the Turf Club – invented what we know as the modern Martini. In any case, the Martinez and the Martini (as it eventually evolved) are quite different drinks. We’re just glad to have both of them. You Say Martinez, I Say . . . .
“So, how is this pronounced again?” asked Mrs. Kitchen Riffs. “Though I would have guessed Mar-TEE-nez,” said Mrs K R.
“Of course, after a couple of these, your pronunciation might be a little off anyway,” said Mrs K R.
Hi Greg, the Martinez had really fun flavor, doesn't it? Different from a Martini, of course, but equally good. We often add orange bitters to a Martini! Bitters really add so much, don't they? Thanks for the comment. I'm curious if gin is your alcohol of choice. I notice a lot of your recipes call for it. My parents aren't fans, so I've actually never even had gin. I think I need to give it a try. Hi Laura, we do like gin, a lot, but probably use it so much because it mixes so well with other spirits. And it's wonderful with vermouth. Probably rum is the spirit we drink most often if we want a drink and aren't testing new recipes. Try a gin and tonic when you try gin. It's so refreshing at this time of the year, and the flavor of gin works really well with tonic water. Thanks for the comment. Always love the history behind your food and drinks. it is interesting how things have evolved. I wonder what they will say about us in another couple hundred years. Beautiful drink and color. Take care! I'm pretty sure my husband will like this one. He's a vermouth drinker. Thanks! Oh wow - I should serve this to the fiance this evening - get him nice and DRUNK! lol! This is so pretty. I love how it's crystal clear and the lemon twist is a beautiful garnish. Such an interesting history too. Hi Cheri, good question about how we'll appear to future generations! At least they'll know we enjoyed good cocktails. :-) Thanks for the comment. Hi Lydia, if your husband likes vermouth, he'll enjoy this. Really good drink. Thanks for the comment. Hi GiGi, it's not nice of you to take advantage of your fiance like that! :-) Thanks for your comment. Hi Chris, this is really a pretty drink, isn't it? Love lemon twist garnishes! Thanks for the comment. You would make a great bartender, better than the one we had here in Frankfurt tonight. Beautiful! You should nominate yourself for the Saveur Blog Awards in the cocktail category. I haven't had the Martinez Cocktail yet but it looks like such an elegant drink. Hi Gerlinde, :-) Thanks for the comment. Hi Pat, nobody makes a red, sweet Martini these days. These are really almost like two different drinks, but it's interesting to see how tastes in drinks evolved -- in the 19th century most drinks were pretty sweet. Thanks for the comment. Hi Denise, we probably should! But knowing us, we won't. :-) Thanks for the comment. Hi Peachy, it's a drink worthy trying. Definitely a bit different! Thanks for the comment. Hi Charlie, a lot of older recipes really are pretty sweet. Kind of interesting, isn't it? Thanks for the comment. Interesting history with this, John! I've never heard of the drink but love everything that's in it and need to try it. Sweet and dry vermouth work for me! And gin only makes it better! Have to try this recipe soon, like as soon as I get the bitters! Thanks! Thank you so much for pointing out that not every cocktail that's served in a stemmed, v-shaped glass is a "Martini." I'm adventurous, but a purist at heart: it ain't a Martini or a Martinez unless it contains GIN. Period. Use those glasses as ye may wish, but don't call your chocolate/raspberry/chambord/cookie dough concoction a "Martini." It just isn't. Hi Dottie, research is fun, isn't it? Always enjoy the amount of it that you do -- which is a lot! Thanks for the comment. Hi Pam, this is really good -- if you like gin, you'll like this. I like all the recipes we've listed in the Notes, but think the best (the one most to our taste) is the one we featured. Thanks for the comment. Hi Lizzie, good rant! I agree, although it's a losing battle. Kind of like the idea of a cookie dough cocktail, though -- very original. :-) Thanks for the comment. Another outstanding cocktail! I've never heard of Old Tom gin. But I certainly want to give it a try after your enchanting description. Love the idea making the lemon twist over the glass, this is great bartender info! Oooooh. This is one to be shared with my gin loving friend... I don't think I've ever tried Vermouth. John, your photography is spot on! Love your drink recipes. This looks so beautiful and the recipe sounds interesting. Can't wait to try this out. Thanks for sharing! Hi Deb, I'm not sure if we'll make Old Tom gin a habit around here, but it's a fun change. Normally I like all the floral notes in dry gin (they're largely missing from Old Tom), but it was a nice change of pace. Thanks for the comment. Hi Liz, we keep a bottle of vermouth in the refrigerator for making drinks, of course, but I also use it in cooking if I don't feel like opening up a bottle of white wine just for a few tablespoons for quarter cup or so. It's also really good on the rocks as a predinner drink. And, of course, in cocktails! Thanks for the comment. Hi Kushi, it's a fun recipe! And still a fun drink, unlike some drinks from the 19th century. Thanks for the comment. Hi John, that's a very nice Martinez cocktail drink. Very impressive pictures. Thanks for sharing. Have a great week ahead, regards. Hi Amelia, isn't this a nice drink? Love its flavor! Thanks for the comment. Hi MJ, I used to think Old Tom was a brand, too. Took me awhile to discover my mistake! And yes, since you love vermouth you'll enjoy this. Thanks for the comment. And this is why I love reading blogs - I've learned so much from this post! Can't wait to try this drink - modern martinis are way too strong for me. Gorgeous photos!!! Hi Mimi, a lot of modern martinis are way too big -- people have 8 or 10 ounce glasses, and try to fill them. We really like cocktail glasses that are 4 or 5 ounces -- you get a must more reasonably sized drink that way. Plus all the vermouth in the Martinez also makes this a weaker drink! Thanks for the comment. John, I think we should meet up sometime soon to catch up. I love all the cocktail recipe you share on your blog. Hi Rahul, that'd be fun! We LOVE doing cocktails! Thanks for the comment. Oh man! You share the BEST cocktail recipes. Every time I come to your blog I want to try all the cocktails you offer! Love reading about the interesting history behind this! Stunning pictures and super awesome Martinez cocktail drink. Thank you for sharing this. Hi Anu, glad you enjoy the cocktails! We do too. Obviously. :-) Thanks for the comment. Love the history of this drink and the tip on stirring not shaking!! Good history lesson and good looking drink, although I prefer you non-alcoholic versions :). Thanks for sharing. Hi Ashley, isn't the history so interesting? Cocktails have the best history! Thanks for the comment. Hi Amira, I try to make the history interesting enough so those that aren't interested in drinking booze can still enjoy the stories. In fact it was the stories that got me into cocktails -- so interesting, aren't they? Thanks for the comment. I loved the history behind it and I love the cocktail too! Hi Katerina, we're smitten by cocktail history! Just love the stories behind some of them. :-) Thanks for the comment. Old Tom gin is a new one to me. A little sweet, huh? That's quite intriguing for gin. And I am a gin lover. A definite must-try now. It was the early 90's and my husband and I were in rural UK in a gorgeous manor house with an adjoining restaurant. In those days, the UK was just up and coming in the food scene (read, not even close), even so, the way they did things had a lot of pomp and circumstance. Case in point, this little carriage house (adjoining restaurant) took your order and served drinks in one room, then you casually walked into the dining room where you were served food. Well, when in Rome, so we ordered two martinis and boy was it a rude awakening. In hindsight, I suspect they may have misunderstood Martinez, because the drinks we were served were mostly sweet vermouth, it was awful (because we were expecting a dry martini), neither of us could drink it. By now, you know that I do not enjoy sweet drinks so this one, although beautifully presented, is not one of my fav's. I did have a Manhattan once but it was a 'family' recipe (not mine) and it was at a Cubs tailgate in Chicago, so it may not have been authentic. It did have a weird flavour because I think there was olive juice poured into it (gag). Anyway, I'll take a traditional martini with a hint of vermouth (just bring out the bottle for a second and put it away...LOL). Cheers! Hi Carolyn, Old Tom is definitely worth a try, particularly in a Martinez. This drink works. I'm going to have to look for some other drinks that use Old Tom! Thanks for the comment. Hi Eva, your comment came through fine. I do have comment moderation on, so it won't show up until I approve it (we don't get nearly as much spam as we used to -- Google seems to have fixed their algorithm to defeat most of it -- but still get enough that I keep comment moderation on). I wonder if what you were served was actually sweet vermouth? In Italy, I've read, ask for a Martini, and you'll get Martini & Rossi brand sweet vermouth. I wouldn't think that'd be the case in the UK, however. In general I don't like sweet drinks, but some sweetness is OK. I used to dislike vermouth in a martini, but have really come to appreciate it -- it works so well with gin (try one made with a 4:1 ratio -- it'll open your eyes). And olive juice in a Manhattan? Yuk! Can't imagine. Thanks for the comment. Gorgeoues cocktail, martinis are the best. I am an extra-dry kinda gal but once in a while this would be the one to pick. Since my trip I am all up on Aperol Spritz, ever tried Aperol? Hi Evelyne, we like really dry cocktails too, usually, but sometimes a change is nice! Have had Aperol, but have never bought a bottle to play with it in cocktails -- should do that! Thanks for the comment. Lots of ingredients in this one - most of which I've never had. I really do need to expand my tastes in alcohol. Another gorgeous cocktail! And thanks for the lesson on making your perfect lemon twists. I actually own that tool so will give it a try. Happy weekend!!! Hi Vicki, the Old Tom gin in this is pretty unusual -- most people probably haven't had it. Including us, until recently. Always wanted to try this drink, but resisted buy an ingredient we wouldn't use that much. But it's worth getting! :-) Thanks for the comment. Hi Liz, it was actually a few of your comment about the difficulty of making twists that inspired me to include that Note! Easy to do if you know how, but not exactly intuitive. Thanks for the comment. Beautiful cocktail. I love throwback recipes, especially drinks. Hi Karen, we're huge fans of throwback recipes too. Particularly cocktails. :-) Thanks for the comment. A genealogy cocktail party foray would be a great idea, John. Hi Debra, that'd be fun, wouldn't it?! Thanks for the comment. I'm always amazed at the number of drinks you find for your blog. I learn something new almost every time! Thanks for sharing this one. Hi Beth, we know a lot more. :-) Thanks for the comment. You have become my go-to place for cocktails. We got out of the "cocktail" habit while raising kids - it was just plain easier to pour a glass of wine! But now, we look forward to a cocktail on Friday eves after the work week. This will go on the rotation - although buying another bottle of gin .... hmmmmm. I love the stories about how the Martinez came to be. I don't care if any of it is true - just love stories. Hi Claudia, we often have a cocktail on Fridays, too! In fact I'll bet most of our cocktails pictures are photographed then, because that's when we're enjoying a drink! :-) We love the stories too -- they're what actually got us into drinking cocktails. Thanks for the comment. Very interesting drink - love the story behind it. Actually all your information and recipes are so well researched and explained - so thanks for that! The color of this drink is very enticing. Thanks John! Hi Tricia, we love research around here. Particularly when it means sampling multiple versions of drinks. :-) Thanks for the comment. Hi Raymund, Old Tom can be a bit hard to find, but London dry is everywhere! Thanks for the comment. This is a great colour and a gin based cocktail is always welcome in my house! Always love the background informaiton you give- it does remind me quite a bit of a Manhattan, and I've never heard of this cocktail. I would never say no to trying it! Hi Caroline, pretty drink, isn't it? Tasty, too. :-) Thanks for the comment. Hi Ritu, it's a fun drink! We enjoyed it. :-) Thanks for the comment. Hi Mary, it really does taste a lot like a Manhattan -- all the vermouth. Really a good one! Thanks for the comment. Hi Zoe, yup, the modern martini is quite different from its ancestors. But we like them all! Thanks for the comment. I have a feeling this is going to become my new favorite drink! And thanks for the info. I always love reading your blog. Hi Jeff, this is a good one! Bet you'll like it. :-) Thanks for the comment. Another gorgeous cocktail, John and one that is new to me and that I can't wait to try! I have a huge bottle of Luxardo that I used once for another recipe but I'll have to look for Old Tom gin! And I love reading your historical notes. I learn so much from you! Thanks! Hi Anne, Old Tom gin is worth a try. And a bottle of Luxardo lasts a long time, doesn't it? :-) Thanks for the comment. Hi Anna, yup. :-) Thanks for the comment. I'm actually not a big fan of martinis, but I think I could really get into the MartinEZ. Hi Frank, I do enjoy a martini, but have to say the Martinez has excellent flavor -- truly a wonderful drink. Thanks for the comment.